The Pomegranate tree is very popular as a bonsai. It is a deciduous tree and drops most or all of its leaves in the winter, but does not produce bright, autumn colors. It has striking flowers that bear fruit and a thick trunk with attractive bark. The trunk has a natural twist that gives a gnarled and ancient appearance which is very appreciated in bonsai. The Pomegranate reached Japan through the silk route and has been admired as a bonsai tree for centuries. There are many varieties with different color, shape and size of flowers and fruit. The pomegranate, its scientific name Punica granatum, is a deciduous broadleaf bonsai tree that is renowned for its pomegranate fruit, and its flowers are beautiful in their own right. The tree trunks of a pomegranate are robust, and their barks are eye-catching. It is native in the Middle East and Southeast Asia, and today, the pomegranate tree grows in different countries worldwide. What makes pomegranate so popular among bonsai enthusiasts? In winter, the Pomegranate tree drops almost all of its leaves, and it doesn’t produce autumn and bright colors. It’s beautiful flowers bear fruit and it has a thick trunk with a very attractive bark because of its natural twist, giving an ancient and gnarled appearance. This look, along with its stunning flowers and fruits, is very much appreciated and most-sought in the world of bonsai. Description The pomegranate is a deciduous broadleaf tree. The tree is renowned for the pomegranate fruit, but the flowers are stunning in their own right. The tree trunks are robust, and the bark is eye-catching. Although it is indigenous to parts of the Middle East and Asia, the pomegranate tree now grows in many different parts of the world. Position It can be grown outdoors all year round in any region that enjoys a Mediterranean-like climate. The pomegranate bonsai can also be grown indoors in a warm, sunny site during the summer months. The tree requires shadier conditions in the winter. Watering The pomegranate tree requires regular watering to keep the soil slightly moist, but not overly wet. Watering should be reduced over the winter months. Misting the tree on a weekly basis is beneficial. Feeding Fertilized the tree every other week once new growth begins in springtime. Either use a liquid fertilizer specifically formulated for bonsai trees or an all-purpose plant food given at half-strength. An additional feed consisting of pulverized organic fertilizer is recommended in mid-spring. Pomegranate plants should not be fertilized in the three months following re-potting. Leaf and Branch Pruning Regular pinching-out of each first or third leaf will increase the plants foliage. It is better to allow young shoots to mature and lengthen before they are cut back to the desired length. Re-potting & Growing Medium Pomegranate trees bloom more abundantly when the roots are pot-bound. As such, re-potting should only be carried out every three or four years, and it should be undertaken during the latter part of the winter season. A soil mixture that contains high levels of lime and sand is ideal for pomegranate trees. Wiring Dwarf pomegranate trees should not be wired because they are likely to suffer die-back. It is much better to use the clip and grow method to shape them. Larger varieties tolerate wiring as long as care is taken. New growth tends to thicken very quickly, so wiring must be removed in a timely manner to prevent the formation of scars. Notes The pomegranate tree needs a number of years in the ground for the trunk to become thick because the trunk will not thicken in a bonsai pot. The plant should receive excellent air circulation because wet conditions may cause the appearance of mold. If mold does develop, the use of a mild grade of fungicide will be effective in combating the mold. Let’s start learning about Pomegranate Bonsai Trees! When it comes to buying a Pomegranate bonsai tree, it is best to buy one with a thick trunk. It takes several years for it to develop a thick trunk, but if it’s not thick enough, it needs to be thickened on the ground before potting. The trunk of a Pomegranate won’t thicken in a bonsai container. Pomegranate trees are native to countries with alluvial soil. They need a well-draining potting mix, centered around a decomposed granite. Giving them organic nutrients is highly beneficial to produce beautiful flowers, broad leaves, and fruits. Pomegranate is considered a fruit-bearing deciduous small tree or shrub that belongs to the family Lythraceae. It is native to Afghanistan, Pakistan and northern India. This tree is widely cultivated throughout the Caucasus region, Middle East, North Africa, Central Asia, and Southeast Asia as well as other parts of the Mediterranean Basin, California, and Arizona. A typical pomegranate tree grows 6 to 10 meters and has multiple spiny branches. It is long-lived as evidenced by some specimens in France that survived for 200 years. Pomegranates are native to places with alluvial soil. They need a potting mix that is well draining and centered around decomposed granite. They also need organic nutrients to produce the broad leaves, flowers and fruit. A mix of 60 per cent aggregate and 40 per cent organic is good. It will also need supplements, either organic or an inorganic time release fertilizer that is specifically for plants that produce flowers and fruit. Pomegranates are very resilient, but should be potted in early spring before they start growing leaves. They flourish in warm weather and like full sunlight during the summer but not so much during the winter. The roots are fibrous and coarse and respond well to root pruning. There are no special precautions required for root pruning as long as it is done at the right time of year. Pomegranates are excellent for bonsai style, but medium to large style is best because of the size of the fruit. Dwarf varieties do not need to be wired and should be shaped by clip and grow. Large varieties can be wired, but when the young growth starts to thicken, the wires need to be removed to avoid scarring. Pomegranates work best as a single tree and not grouped because of the flowers and fruits. A formal, upright style won’t work. The natural style is semi-cascade, informal and multi-trunk styles such as twisting trunk style. To increase foliage, the tender green shoots can be pinched by hand at the first or third leaves. New shoots should be allowed to mature longer than desired, then cut back to the desired length. Natural die-back will also affect the shape and style of the tree. When buying a Pomegranate it is best to get one with a thick trunk. 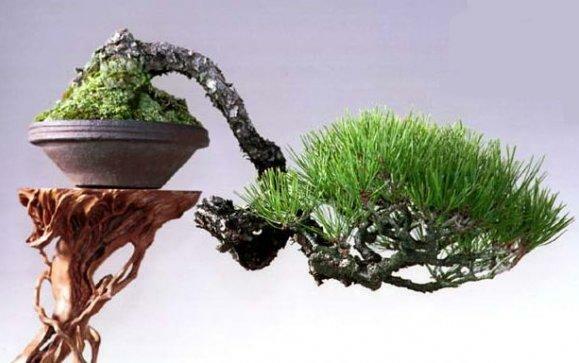 It takes several years for it to develop a thick trunk, and this is what is needed for a good bonsai. If the trunk is not thick enough, it should be thickened in the ground before potting, because it will not thicken in a bonsai pot. Root rot can happen if there is not sufficient drainage, and mold may appear during wet months. Keep sufficient air circulation to combat mold and use a mild fungicide. Scale insects, aphids and the pomegranate butterfly caterpillar are pests to be removed. An insecticide with Resmethrin, Acephate or Triforine could be used in as weak a solution as possible to still be effective. Trees can be sprayed every couple of months with an insect spray that is non-toxic, but not when the soil is dry. All bonsai trees need careful watering because their pots are small and may dry quickly. The tree should be thoroughly watered and kept damp but not wet. It is recommended to water less in the winter. Water should be added slowly so that it doesn’t run out over the top of the pot. Weekly misting may also help the Pomegranate tree. If the tree has good drainage, it is almost impossible to over water. One trick for bonsai trees is to submerge the pot into one or two inches of water and let it absorb the water through the holes in the bottom of the pot. Bonsais need fertilizer because of the small area where they live. Once the new leaves begin to appear in the spring, it is all right to fertilize the tree. Every two weeks from the beginning of spring to autumn a liquid bonsai fertilizer or half-strength general purpose plant food can be given. In mid-spring, give the Pomegranate pulverized organic fertilizer in addition to the regular food. Do not give it any fertilizer for three months after it has been potted. Bonsais should also not be wired just after repotting. When it is time to wire, use the thinnest wire possible that will hold the branch in position. Begin wiring at the base of the trunk and wind it around the trunk as an anchor. When the branch is reached the wire should be wound around the branch in the direction it is bent, so the wire will not loosen. If the wire is wrapped too tightly, the branch will become scarred. The tree needs to be carefully watched to make sure the wire is not cutting into the branch. If this begins to happen, the wire should be immediately removed. A new wire can then be put. Pomegranate branches are brittle, so care should be taken when wiring that they don’t break. When repotting every three to four years, the roots should be reduced gradually. Only one third of the root ball should be removed at each repotting. A proportional number of old leaves can also be removed at this time. Complete defoliation is recommended if drastic root pruning is needed. The tree should be repot into soil high in lime and sand content for fast draining. The pot should be slightly deep and not too shallow. The plant flowers well when it is root-bound and has enough water. Repotting should be done in late winter. Pomegranates do not like frost and should be brought inside if it gets too cold during the winter. If possible, a greenhouse is the best place for the tree if the climate is cold. If the tree is shaded and kept slightly dry before mid-season, it will produce flowering shoots. It needs good light, but needs protection from drying winds. Pomegranate bonsai trees can be cultivated outdoors in any region having a Mediterranean-like climate all year round. You can also grow pomegranate bonsai trees indoors in a sunny site and warm weather during summer. These trees require shadier conditions during winter. This bonsai tree is subtropical and quite a hardy plant that can withstand low temperatures, reaching 14 degrees Fahrenheit. This tree loves the sun, but bring it inside once the air temperature hits 41 degrees Fahrenheit or so. This is your best choice if you are living in a temperate climate. Just remember to keep your pomegranate bonsai tree outdoors during warm weather. Pomegranate bonsai trees love the full sun, so when they are indoors, make sure that they are given a good position in a sunny window or give them enough artificial light. Pomegranate bonsai tolerates a little less light during winter. One of the qualities of a Pomegranate bonsai trees is that they’re relatively easy to propagate using seeds. Just simply rinse the seeds, rubbing them in a paper towel to remove any pulpy coating, and allowing to dry for a few days. Plant your pomegranate in a starter soil so you can put the entire seedling pot into a plastic bag in order to increase humidity, thus keeping moist until they are germinated. Pomegranate bonsai trees can also be propagated by cuttings, division, and layering. A pomegranate bonsai has a fairly average water needs requirement. Keep your pomegranate bonsai moist but not overly saturated because it is vulnerable to root rot. Don’t allow the compost soil to dry completely. Use a moisture meter to help you in regulating the bonsai tree’s watering schedule. Pomegranate bonsai still benefits from an occasional misting, like once a week, even if they are accustomed to a dry weather. Feed your Pomegranate bonsai twice a week from the time of a new growth appears during spring up to the end of summer. You can use a liquid bonsai fertilizer. You can also use an all-purpose plant fertilizer that is diluted to half-strength. For a more vigorous bloom as well as fruit growth, you can use a blend with high amounts of phosphorus and potassium. Do not fertilize your pomegranate bonsai for 3 months after repotting. Tip #1: Bonsai trees, like pomegranate, live in small containers or pots and they tend to dry out much faster than the plants in bigger pots or in the ground, so pay close attention when watering. Tip #2: Strike a balance between insufficient water and excessive water. Water your pomegranate bonsai thoroughly, and keep it damp but not too wet. You need to reduce watering during winter. An old watering trick is placing the entire bonsai pot in a sink of water, about an inch or two deep, letting the water absorb water from the holes in the bottom part of the pot. Tip #3: Your Pomegranate tree can benefit from weekly misting. Tip #4: You can use an inexpensive moisture meter to avoid the guesswork when watering. Tip #5: Water your pomegranate bonsai slowly so it is absorbed into the soil, otherwise the water will be running all over your table. We have prepared a general watering technique guide recommended for all bonsai trees according to the season. Just keep in mind that once the water coming out the pot’s drainage holes, it only means that the water is enough. It is important to water your bonsai plants twice a day, once in the morning and second, in the evening. Don’t water the leaves of your bonsai tree when the sun is very hot because it may cause burnt leaves. Never water your bonsai trees when the weather is too hot because the water inside the pot may get too hot, spoiling the roots. If you are planning to go on a long trip, and you won’t be able to water your bonsai plants every day, you need to abundantly water it before leaving. It is important to leave your bonsai tree in a place where it is cool without exposure to the sun. Put the bonsai container in a water bucket so your bonsai tree can obtain water from the bottom. This helps your bonsai tree to survive for around up to 3 days. Watering your bonsai tree once or twice a week is very important. Avoid watering your bonsai plants when the temperature is freezing or too cold, most especially during early mornings or at midnight. A soil that is frozen can kill your bonsai plant. Watering your bonsai trees once a day n spring and autumn are highly recommended. Watering your bonsai plants when the soil is slightly dry is the best. Every day, you need to water your bonsai plants regularly at the same time. The pomegranate bonsai tree needs watering on a regular basis for a slightly moist soil, but not excessively wet. Reduce watering during winter months. Misting your pomegranate bonsai tree on a weekly basis is proven to be highly beneficial. You need to fertilize your pomegranate bonsai tree every other week when new growth starts in springtime. You can use a liquid fertilizer that is specifically formulated for pomegranate bonsai trees. It is also fine to use an all-purpose bonsai plant food given at 50% strength. The additional feed consists of pulverized organic fertilizer which is recommended during mid-spring. Remember that pomegranate bonsai trees shouldn’t be fertilized at least 3 months after re-potting. Bonsai fertilizer is considered a regular plant fertilizer. They do not contain any secret or special ingredient that is meant specifically for growing bonsai with a balanced NPK ratio. You can purchase bonsai fertilizers online or a bonsai shop to get the right balance for specifically for your bonsai tree species, age, and time of year. You can purchase bonsai fertilizer in solid or liquid form. A solid fertilizer usually comes in a form of pellets, granules, or powder. It is planted on the top of the compost soil below the surface. It slowly dissolves over time as the bonsai tree is watered. For an outdoor bonsai tree, you need to use a fertilizer basket or cover to ensure that the granules or pellets stay in place. They should not be washed away or stolen by animals. Liquid bonsai fertilizer is usually available as a concentrate and it should be diluted prior to application. You’ll need to mix the liquid fertilizer with water, pouring it onto the moistened soil. 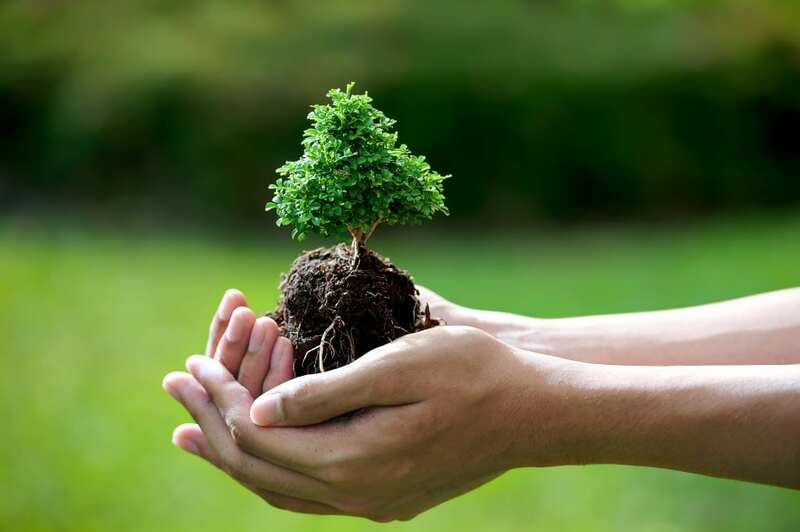 Many bonsai growers like to use solid fertilizers as they provide your bonsai tree with a continual and steady supply of nutrients, that need to be replaced every a couple of months. However, liquid fertilizers have a tendency attracting maggots and other pests, and they may have an offensive odor, affecting the general aesthetic appeal of your bonsai tree because they are visible. Solid fertilizers give a better control when it comes to the number being added. On the other hand, liquid fertilizers can be difficult to dilute or mix, increasing the chance or risk of over fertilizing. Some bonsai growers choose liquid fertilizers because of their fast action. Even if the effects are short-lived and liquid fertilizers increase the need to fertilize more frequently, they can give your bonsai plants the immediate boost they need, most especially when the bonsai trees are just coming out of the dormancy stage. Pomegranate bonsai trees, like any other plants, need to be fertilized. These general guidelines need to be followed, but there are exceptions. For instance, if you want to encourage your bonsai tree to bear fruit and flower, you’ll need to use an effective bonsai fertilizer, either a solid or liquid fertilizer, with a high potassium content. Tip #1: Pomegranate bonsai trees bloom abundantly when the roots are not pot-bound, so re-potting should be carried out every 3 or 4 years, and it should be done during the latter part of the winter. Tip #2: You can also re-pot your pomegranate bonsai in spring, just before new buds develop. Younger bonsai trees can be re-potted every 1 to 2 years, whereas older trees should be re-potted every 2 to 3 years or when the roots outgrow the soil. Tip #3: Pomegranate flowers are best when there is slight root-bound, so don’t use a shallow container for this bonsai tree. Prune up to 1/3 third of the root ball but not more than 50% of the fine roots. Transplant your pomegranate bonsai tree into a well-draining soil like a Fujiyama soil mix. Step #1: Determine the perfect time to re-pot your pomegranate bonsai tree. Re-potting your bonsai is done to avoid root bound. To determine if this is happening, carefully lift your bonsai tree from the container. If the roots of your bonsai encircle themselves and the pot, it’s time to re-pot your pomegranate bonsai. Otherwise, the roots will grow thick and may displace all of the soil within the roots or will starve. Step #2: Choose the best time of year for re-potting your pomegranate bonsai tree. You need to re-pot your bonsai in early spring. At this time, the bonsai tree is not under the pressure of having a full foliage. It will be less subjected to stress and shock caused by re-potting. Step #3: Remove the old soil as much as you can from the roots of the pomegranate bonsai tree. 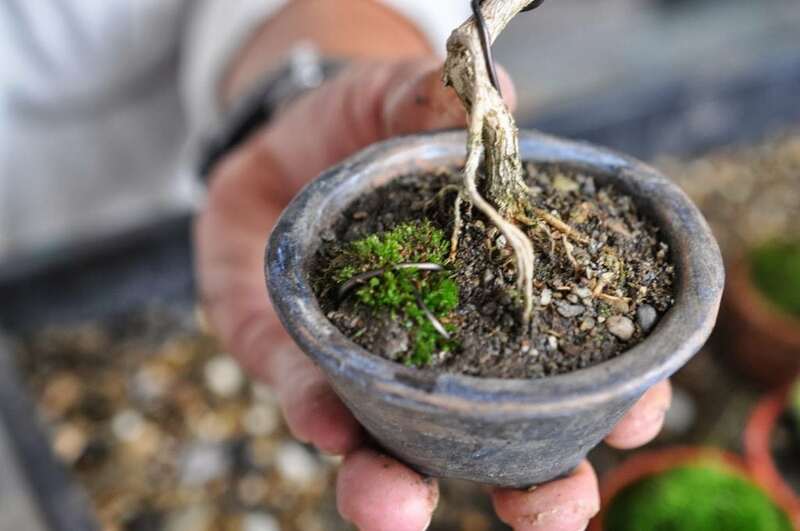 Knock as much soil as you can out of your bonsai tree’s root system using a bonsai root hook. Gently disentangling the roots should be performed if the roots have grown thickly. Step #4: After untangling the roots of your bonsai, prune some longer roots to keep your pomegranate bonsai tree from outgrowing the pot. It is helpful to also remove any sick or rotting roots. Do not remove more than 25% of your bonsai tree’s total root mass to ensure that there are enough roots left for proper water and nutrient absorption. Step #5: Reposition your pomegranate bonsai tree in its pot. If the roots are trimmed, you need to gently lower it back into its pot. Fill the pot with a potting mix up to the brim after. Prevent air pockets by working into the soil as well as the root structure in between the roots. The composition of a bonsai potting mix includes compost, gravel, and akadama with a 2-1-1 ratio. Step #6: Water your pom bonsai trees after re-potting to help the compost soil in settling. Protect your pomegranate against a strong gust of winds for about a month or so after re-potting because they are not fully established in the soil. Pomegranate bonsai trees, like any other bonsai species grown in containers, should be re-potted to keep it healthy and strong by replenishing the lost of nutrients from the soil. It also helps regulate root growth, and keep the compost soil from being compacted. Now, you have just learned how to re-pot your pomegranate bonsai tree, so you’re ready to apply and hone your bonsai gardening skills. Pomegranate bonsai trees are not recommended to be wired because they’re likely to suffer die-back. It is better to do the “clip and grow” technique to shape them. 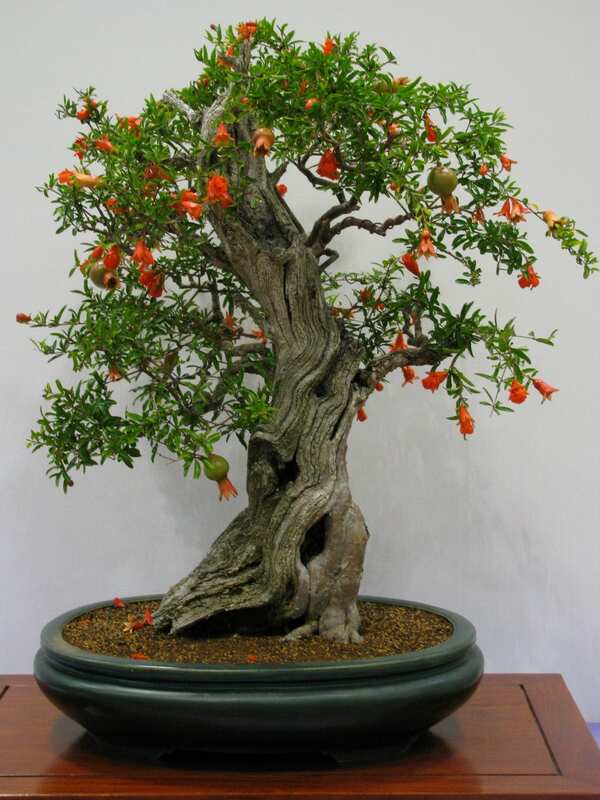 The larger varieties of pomegranate bonsai trees can tolerate wiring with great care given. Remember that they have a quick thickening of new growth, so the wiring should be removed in a timely manner, thus preventing scar formation. When it comes to most flattering bonsai styles for a Pomegranate bonsai, the informal upright, slanting, semi-cascade, multi-trunks, and twisted trunk are the best. You can pinch new shoots to 1 to 3 leaf sets using your hands rather than using clippers. Allow the branches of your pomegranate bonsai to grow longer more than you want them to be for stimulating new growth, and then prune. If you want your pomegranate bonsai tree to flower and bear fruit, you need wait until blooming is finished before doing any pruning. You can wire larger varieties of your Pomegranate bonsai trees can be with the use of a thin copper or aluminum wire for the bonsai branch. Be careful because wrapping too tightly or bending too drastically all at once tend to result to brittle branches. Dwarf Pomegranate bonsai trees can be shaped by the use of the clip and grow method only. Regular pinch every first or third leaf to help in increasing the bonsai plant’s foliage. It is best to allow young shoots to fully mature and lengthen before you cut them back to your desired length. When shaping pomegranate bonsai trees, it is best to use the “clip and grow” method than wiring because they may suffer dieback. Pomegranate bonsai are best when they are formed into informal upright and semi-cascade. Pomegranate bonsai trees may be attacked by whitefly, pomegranate butterfly caterpillars, or aphids. Whitefly is a problem with indoor bonsai trees. It can be controlled by spraying the bonsai tree with water, most especially underneath the leaves. You need to provide a good ventilation to your pomegranate bonsai to keep nuisance whiteflies away. Aphids can be rinsed off using a jet of water. Spraying your pomegranate bonsai tree every few months using non-toxic insecticide will help protect your pomegranate bonsai from pests. Inspection of your bonsai for the early signs of pests is crucial. Don’t spray your bonsai tree with an insecticide if the soil is dry. Your pomegranate bonsai tree can be infested with mold most especially in the wet months. In order to control the mold problem, provide your bonsai a good ventilation and pest treatment using a fungicide. Like any other bonsai trees, pomegranate bonsai can be infected with pests and diseases. But as long as you follow the right watering, fertilizing, re-potting, and other growing techniques, you’ll be able to grow your pomegranate bonsai without so much problem. Pomegranate bonsai trees are famous for their fruit-bearing and flowering characteristics. They are both suitable for beginners and expert bonsai growers. They can be infested by pests and also experience diseases, but all of these can be prevented and treated. We hope that you enjoyed this tutorial and learned a lot. You can share your learning on this guide to your friends and family through your social media account, like Facebook, and kindly comment below to share your insights and experiences with us! Happy bonsai growing!